I’m not one of those people who always has to listen to an iPod all day, but if I was, then I’m sure I would forget to charge it. Hopefully, you can carry around a backup charger handy. 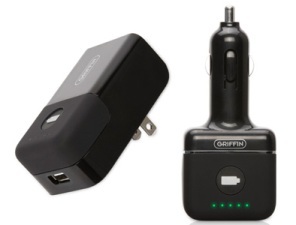 According to Griffin’s website, their PowerDuo Reserve is “the industry’s most trusted AC and 12 volt chargers”. The included portable battery is designed for the iPod and iPhone. All you have to do is magnetically lock the small battery pack to the car charger or AC adapter, and the tiny green lights let the user known when it is charged. Later, when you are listening to your iPod and see that its battery is getting low, just plug in the charged battery pack for a little more juice. I had a chance to try it out, and it didn’t take long to charge the Reserve Support battery at all. My only complaint is that the car charger adapter and AC adapter had a USB port, but there was nothing in the Power Duo Reserve that seemed useful for recharging USB devices. I suppose you could use the included USB to iPod connector cord to charge it that way if you want to. You should be able to purchase the Power Duo Reserve for about $59.99 on the Griffin site.